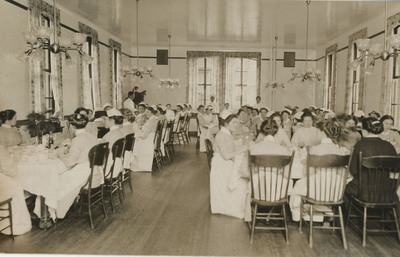 This image of the Nurses' Dining Room at the Good Samaritan Hospital was used on a postcard. An additional image of annotations made on the back of the photograph can be downloaded from the additional files below. Unknown, "The Nurses' Dining Room" (2012). Good Samaritan School of Nursing Photographs. Image. Submission 52. This is a scan taken of the back of the photograph. This image contains some descriptive annotations.